Play with local rescue puppies and learn how to save a life! 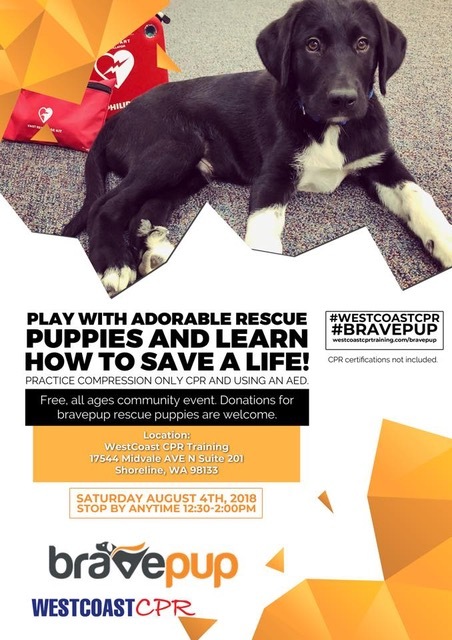 WestCoast CPR Training is having a puppy visit from Bravepup, and you’re invited! Learn compression only CPR and how to use a defibrillator. WestCoast CPR instructors and CPR training equipment will be available for the community. WestCoast CPR is a local Shoreline business that provides 1-hour CPR classes 7 days a week. They also conduct on-site CPR and First Aid training for local businesses. WestCoast CPR, 17544 Midvale Ave N, Ste 201, Shoreline 98133. Bravepup brings adoptable rescue puppies to businesses and organizations for employee health and wellness. We provide a fun and innovative solution for corporate wellness programs to relieve stress, boost morale and contribute to a good cause. Donations from our Puppy Delivery Program help us rescue and transport puppies (and moms) from overcrowded, high-kill shelters in the South. Spaying/neutering is less common of a practice in the American South, leading to pet overpopulation and overcrowding at animal shelters. It’s not uncommon for a litter of puppies to be abandoned on the side of the road or euthanized due to shelter overcrowding and risk of disease transmission. We rescue puppies from high-kill shelters in rural Georgia, provide proper veterinary care and treatment and transport them on Bravepup Freedom Flight to Seattle. Once in Seattle, our puppies live in volunteer foster homes and receive some much-needed love and socialization through our Puppy Delivery Program before finding forever homes.